Fill your home with the sweet scent of gardenia, roses and other flowers from your garden with homemade lamp oil. You can also make scented lamp oil from herbs, spices and citrus peel for a custom-designed fragrance for your home. Discover which blends create your favorite scent or explore the benefits of aromatherapy with lamp oils made from natural essential oils. Cut 3 cups of rosemary from your garden during the early to mid morning hours as this is when the fragrance is most intense. Make sure that no pesticides have been used on the leaves. 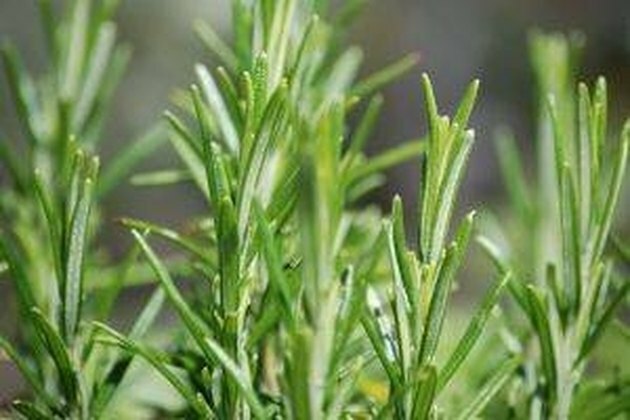 You can also purchase rosemary from your local organic garden shop, herb supply store or florist. Flowers, spices and citrus peel can also be used, following the same process as for the rosemary oil. Roughly chop the rosemary, put it in a plastic bag and seal it. Roll the mason jar or a rolling pin over the bag to bruise the herbs. You can also use a mortar and pestle if you have one. This will help bring out the natural fragrances in the rosemary. Add ½ cup of sweet, cold-pressed almond oil to one of the mason jars. Add the rosemary and seal the jar tightly. Shake the jar to blend and further bruise the rosemary. Store the jar in a moderately warm room with temperatures ranging from 68 to 75 degrees F. Shake the jar once each day for one week. Store the jar in a dark place with moderate temperatures for two more weeks, letting it age and absorb the rosemary's scent. No shaking is needed for these two weeks; let the rosemary oil be still. Strain the oil through the cheese cloth into the unused mason jar to remove the rosemary pieces. Throw away the rosemary and the cheesecloth. Store your rosemary oil in dark bottles to keep light from impacting the strength of the aroma and the shelf life. You can order small, dark dropper bottles online for essential oil storage (see Resources below). Add 15 to 30 drops of your rosemary-scented oil to the unscented lamp oil. The amount of rosemary oil you add should be based on your preference, with more drops offering a stronger aroma. How do I Burn Mineral Oil in Oil Lamps?